Prince Harry and Meghan Markle’s dream wedding at St. George’s Chapel on May 19 was witnessed by millions of people across the world. The positivity associated with the royal couple ensured that many businesses launched marketing campaigns focused on them. Most of these campaigns featured promotional merchandise that highlighted the royal couple in a creative manner. This delicious tin of shortbread does two jobs – the tin can serve as an eternal souvenir while the scrumptious sweets will leave behind a taste that lingers for a long time! The tin has been sold out but can be viewed here. Well, this product is unique in this list because it wasn’t part of any company’s marketing efforts. These bags were given away by the royal palace. 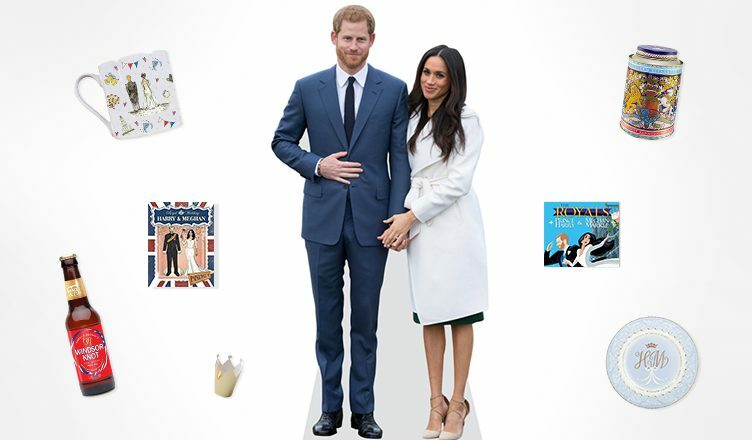 Each gift bag features goodies that include a commemorative chocolate coin, a bottle of water, a refrigerator magnet, a special guest badge, a map of Windsor Castle, wedding-themed shortbread cookies and an Order of Service. One guest immediately listed the bag on eBay for sale (sold for $1,368!). Here is a commemorative plate that was commissioned exclusively by the royal family. Featuring a classy design, this product was a hit with commoners too! Here is a link to the product on johnlewis.com. Harry and Meghan: A Love Story Coloring Book is the name of a book conceptualized by Teresa Goodridge. It features 30 exciting ready-to-color illustrations that successfully capture the magic of their love. The colored pages can be removed for display at easily viewable locations. Here is a link to the product. This comic book has quality illustrations by popular artist Joey Mason. It features a behind-the-curtain glimpse at the royal couple prior to their wedding. Here is a link to the product. At Promo Direct, we receive requests for creating promotional merchandise aimed at events. We have transformed swag bags, mugs, t-shirts, and a lot of other products into highly personalized merchandise that can represent a wedding, concert, conference, or any important occasion. Get in touch with us to make your event a truly remarkable one – we will provide you with merchandise that can make your event memorable for years!